Some good photos... some bad photos.. Although the jacket turned out well over all, I could have used a little more experience before tackling this project. Starting out, I had no clue how to modify the pattern to fit me. Since it's a fitted jacket, this would have been a good thing to know! Unfortunately, the waist of the jacket hits a few inches too high, and the flare at the hips hides my natural waist. In a word, it's unflattering, but I fortunately found a great belt to help me out. It's not perfect, but it will definitely work. I initially had some trouble finding the notions necessary for bustling the skirt, but I think I eventually got it right. If I recall correctly, the pattern calls for ring tape and "rings to slip on." The only ring tape I could find is the kind used for Venetian blinds and the rings are quite spread apart. My solution was to use the ring tape, plastic rings, and little metal hooks like these. I hand sewed extra rings onto the ring tape and reinforced the rings sewn onto the under skirt. The stitching to hold the ring tape in place shows on the outside of the skirt a bit, and the folds need a bit of arranging to sit nicely. I added some Velcro below the button to keep it flat and closed. It looks like the pattern instructions might have been updated (pdf) since I started. I've also found a lot more pictures of people who have made the costume, which are nice to see but would have been more helpful a few months ago. I don't want to carry a purse with the costume, so I made some pockets from this pattern (Simplicity 3635). There are two pockets strung on a piece of ribbon. Thanks to Q for the idea! Overall they were easy to make, but I did have some trouble getting the bias tape to lay flat in some areas. I'll probably wear them under the over-skirt, rather than on top like the photo shows, which unfortunately means they won't be visible most of the time. At least I know they're there and they'll carry my stuff. I used brown vinyl ("leather"), cream lace, and cream bias tape. 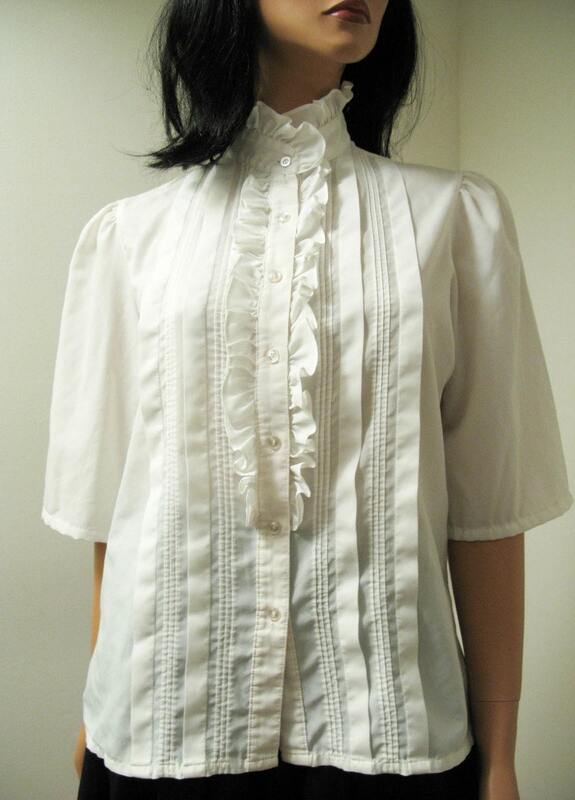 It's lined with the same fabric used for the over-skirt and jacket details (sleeve cuffs and front center). I found a great shirt on Etsy to wear under the jacket. It needs some altering to fit nicely under the jacket, but it has a few things I was looking for. High collar? Check. Short sleeves? Check. Froofy and Victorian(ish)? Double check. Beyond all of that, I still have plenty of hemming to do and I'm still thinking about ways to holster the Nerf gun. I'm keeping an eye out for other interesting things to add, but I'm definitely looking forward to being finished! WOW! WOW! It looks really great! I think that shirt will look wonderful under the jacket. The pockets are really clever, but I think they\'d look better underneath so you don\'t hide the wonderful bustling on the sides. It looks really great! Maybe you could hang a holster off of your belt, so that its easy access- you know - just in case. Hopefully I'll have another update (and a finished costume) soon!